With the British Pie Awards judging having been completed and the results not out until Friday, Day Four of British Pie Week saw Pierateers SJL and TJP return to work but Pierateer RAS attempt to complete another of his #PiePledge commitments by using his day off to visit the 2014 and 2016 Scotch Pie World Champion The Kandy Bar Bakery! After spending day one of British Pie Week away in Cardiff to pick up some Clark's Pies from their shop and day three being the English leg (which consisted of judging for the first time at the British Pie Awards, followed by taking on the Desperate Dan Cow Pie Challenge at Tipton's very own Mad O'Rourkes Pie Factory pub), day four would be the final stage of my #TriPie pie pledge. I was heading up to Scotland for the first time to visit the home of the World Scotch Pie Champion for 2014 and 2016, The Kandy Bar Bakery in Saltcoats, on the West Coast about 40 minutes train journey from Glasgow. Planning to do the trip in a day meant a reasonably early start up on the train to Glasgow, followed by a flight back to Birmingham that evening. The four hour train journey on Virgin Trains gave a decent amount of time to get a few pie reviews written up, ready to arrive in Glasgow and travel out to Saltcoats. Upon walking up to the main Kandy Bar Bakery shop I actually ended up following owner Stephen the last part of the way as he carried a batch of scotch pies from the shop further down the high street. Upon arriving at the shop I was made to feel very welcome by Stephen and the team, having a tour around the bakery and then a long chat of about 90 minutes or so in the café, which of course included getting my hands on one of their famous Scotch Pies! 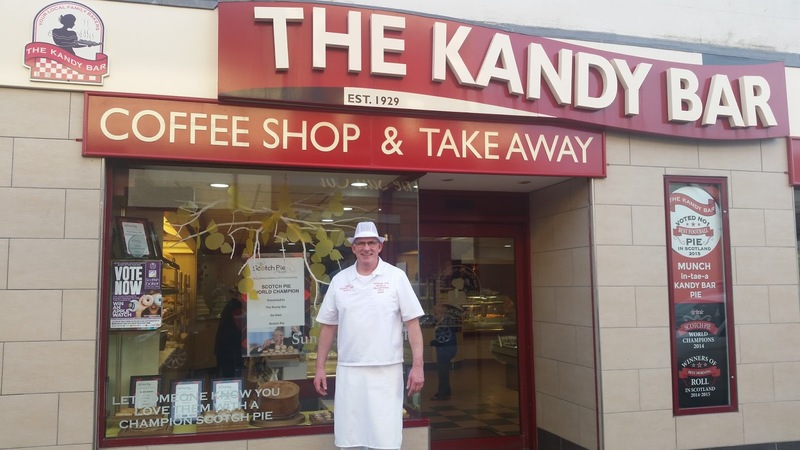 I'll be going into more depth in my review, but needless to say it was fantastic to chat for so long with Stephen and his wife Rona, who gave a great insight into Team Kandy Bar! After my visit and loaded up with Kandy Bar Bakery pie goodies, I headed back to Glasgow to take a little look round the city and popped into Beer Café, in the Merchant City area. This bar specialises in selling Pieminister pies (of which we've pie rated many) and was recommended by fellow blogger @thingssarahloves. While I didn't have enough time to get a pie this time and didn't feel hungry enough to eat there anyway, I had a nice drink and brief chat about pies to the staff there! 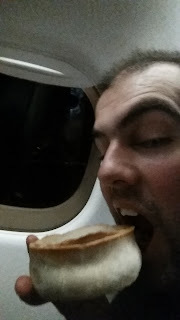 I then headed to Glasgow International Airport for my flight back to Birmingham, where on the plane home I had "pie in the sky" - just, well, because I could! Thanks to the Kandy Bar Bakery for supplying the hot pie for me to eat on my way home too, even if it had cooled down by the time I ate it! I'll be pie rating the cold Scotch pies I brought back from The Kandy Bar Bakery with Pierateer SJL on Saturday! On Day Four of British Pie Week Pierateer Sam continued his unique ways to eat pie series by doing a pie review... in bed! What pie could he possibly get hold of for just 23.2p?! This followed yesterday's pie review in the middle of the British Pie Awards, Tuesday's Pie Kebab and Sam drinking a pie in Monday's pie-nt challenge, which you can watch the video of here.